Most cardboard designs you find are functional, but not too imaginative. Not so, Giles Miller cardboard... Allow me to present just some of them. I have to show you some fashion items first, because it's a new area for Miller - a diversion from cardboard furniture designs. 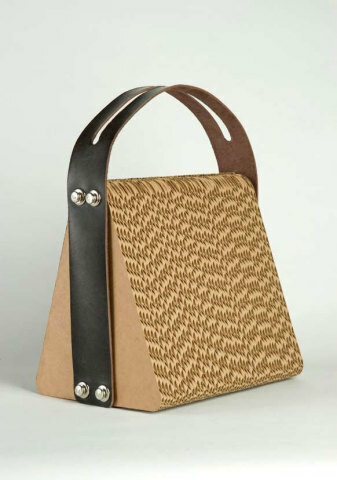 The name, 'Brown Paper Handbag' is a plain one for a bag of such intricate design. But here it is, corrugated cardboard, leather strap, and chrome buckles. I'll leave the price to your imagination. Another personal accessory I had to show you before I move to the exquisite cardboard furniture Miller created. Aren't these cases sooo cool? 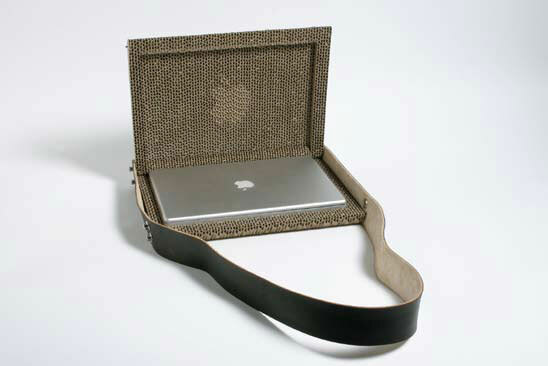 A sustainable and fashionable Mac bag. Yes, they are only for Macbooks, but they come in three sizes! Thirteen, 15, and 17 inch Macbooks. 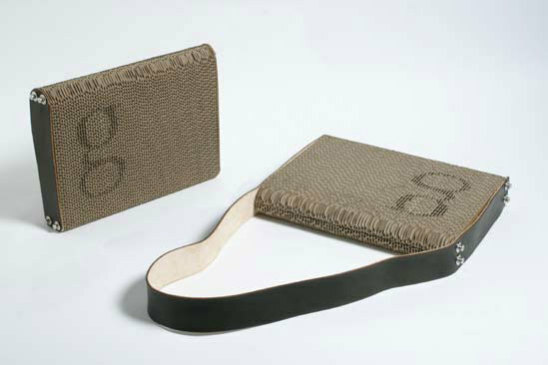 Computer cases made of corrugated cardboard, leather strap, and chrome buckles. Now, into lighting design. An OMG floral pattern for this floor lamp - what an eye-catcher. 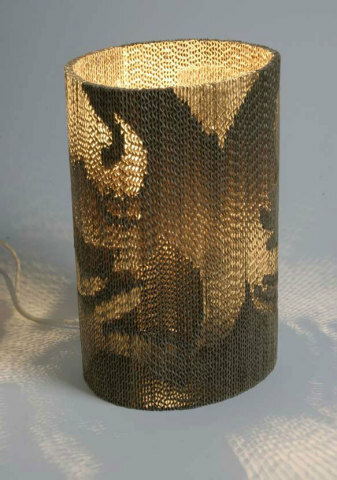 The design, beautiful on the lamp as well as its reflections, is a trademark of Giles Miller. Wait... you'll see more. The Grandfather C. can be flat-packed for shipping. 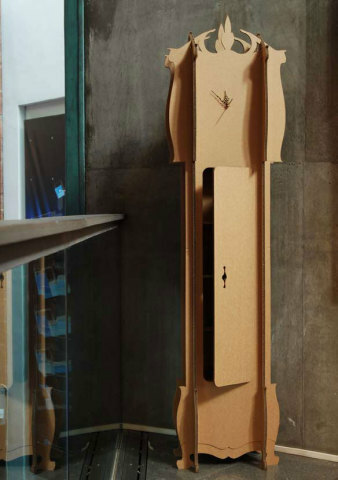 It's a real clock, don't worry, but it also has a reall cabinet with shelves, paying tribute to the traditional styles of British furniture. 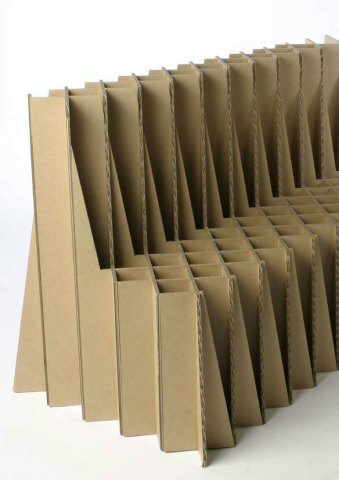 Miller gives his very first cardboard product such a descriptive name; it's "a structural and sculptural piece." Well said! The Pool Rocker is even more intricate than the Ex-Box in its sculptural design. 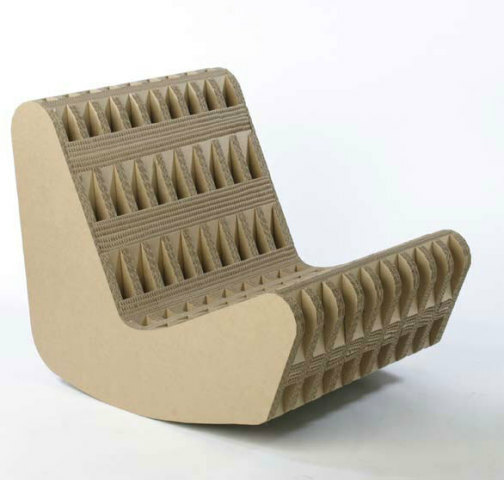 Writes Miller, "Inspired by Willy Guhl’s ‘Loop’ chair, the Pool Rocker makes a strong statement about the aesthetics and structural integrity of cardboard. 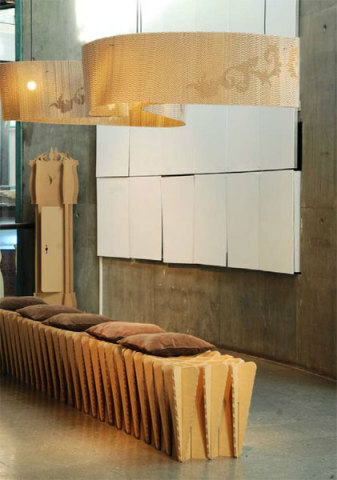 I can't show you every piece of Miller's cardboard furniture, so I'll share some interior designs he has set up as installations. Kingly Court is a modern and popular shopping center in London. 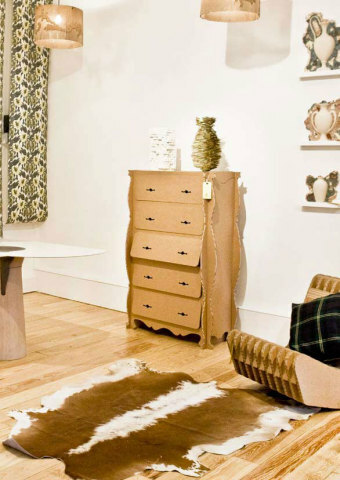 At a showroom, Millers furniture is stunningly presented. This wide wall of exquisite images and patterns looks like it is either split by a glass door, or the glass is a mirror reflecting part of the wall mural that is opposite the mirror. 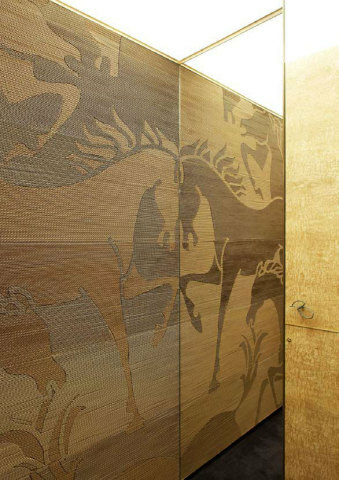 Miller creates room dividers in similar motifs. 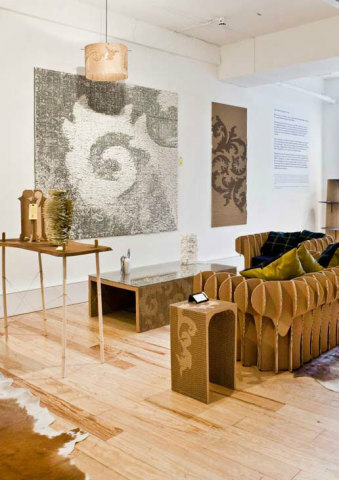 They display Giles's talent not only a cardboard structuralist and sculptor, but as an artisan and artist. Miller's furniture can be adapted for a large space, like the living area above, or a smaller room, such as the interior of a bedroom. What a glorious lighting design! And the Ex-Box Bench has been extended a few feet and made comfy with with some soft pillows. Perfectly suited for a Miller show or for a museum or gallery featuring other works. I couldn't finish this column without showing you the Miller piece that led me to his design spot on the web. Here it is: The Hirsutio Vase, named so after a condition known as hirsutism in which excessive hair growth, particularly on the male body, is the result of lots of male hormones. 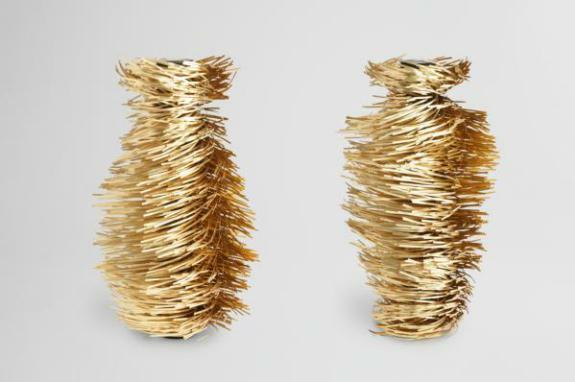 The Hirsutio Vase, like some male body hair, can be very wild and unruly. As I wrote in the introduction, you can fluff the brass hairs into any design you like. The Hirsutio Vase and other new works of Giles Miller, some cardboard, some not, will be on display at Stand C01 100% Design, London on September 23 -26, 2010.